I was heading into work today, and heard an ad on the radio for the Carl's Jr. Grilled Cheese Bacon Burger. I've seen the ad on TV, bunch of tough guys at a diner, getting their steak sandwiches, one of them is making eyes at the hot girls at the next table, but then the waitress brings him his grilled cheese sandwich and seems disgusted by him. And the girls lose interest, because, after all, what kind of loser would order a grilled cheese sandwich? But it's Carl's Jr. to the rescue! They're going to make a grilled cheese sandwich that a real man can eat without being ashamed! So immediately I could tell a difference between this and a cheeseburger: this one has some sort of bread on the outside instead of a bun. But I couldn't see any other difference. Maybe a little bit more cheese? My conclusion? 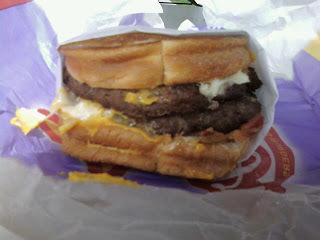 This is Carl's Jr.'s version of the Bacon Ultimate Cheeseburger from Jack In The Box. It was definitely tasty, maybe worth the price if I hadn't upgraded to the criss-cut fries. Multiple types of cheese, the burger, and the bread was good. Bacon was fine, but I could really handle a version that did not have the bacon. But don't expect anything fancy, or really even resembling a grilled cheese sandwich, since that should really have bread and cheese. Just a head's up if you choose to get one, it comes with mayo on it. I'm not a fan of mayo, but I can handle it. But there was nothing else on there, so that's a plus. I also thought isn't thaat juast a cheese burger. Thanks for clearing that up for me. Sara - Glad I could help!